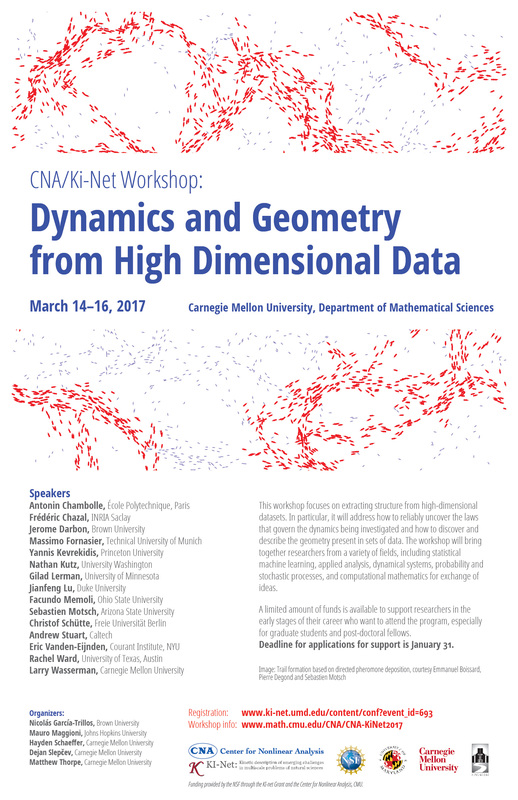 This workshop focuses on extracting structure from high-dimensional datasets. In particular, it will address how to reliably uncover the laws that govern the dynamics being investigated and how to discover and describe the geometry present in sets of data. The workshop will bring together researchers from a variety of fields, including statistical machine learning, applied analysis, dynamical systems, probability and stochastic processes, and computational mathematics for exchange of ideas. Deadline for applications for support is January 31. Funding provided by the National Science Foundation through the KI-net Grant and the Center for Nonlinear Analysis, CMU.